ok. I decided to just go for it with the t160 I saw saturday. The dealer guy has been pretty nice about answering emails. He also has been good so far this morning about sending me forms and stuff they need. I think it will work out nicely. I got a pretty good deal money wise on it. takes around 2 hours (they make sure everything works and go over how to use everything on it with you). Looks like tomorrow afternoon I will be heading down and getting some training (!) 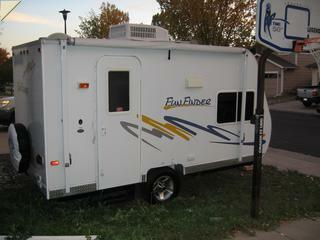 and pick up the new travel trailer. Should be pretty fun. I am looking forward to having it. I cleaned out the side yard at the house this afternoon and got it ready to push in there if I need to. Also tomorrow evening I am heading down to take Nash to a puppy play session. Theres another slightly younger pup owned by some friends of mine, and it will be amusing to get them together to play. I predict they will have a wonderfull time and perhaps wear both of them out. Friday was nice and busy. Went down and picked the trailer. The guy who was doing the walkthrough with me was an ex greyhound owner. 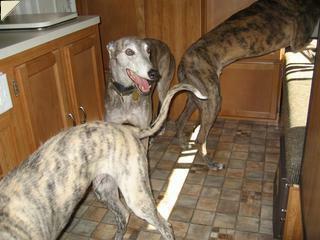 His hound had lived to 15 and passed away recently. The only snag I noticed was that they didn’t have a wheel on the tounge jack as I was hoping. They said that they would have to order one, which was anoying. After the walk through, I went over to the dealer to do the paperwork and he scrounged me up a wheel, which was nice of him. Had no trouble with the tow back home. I noticed the tailer was there when going over bumps and the like, and the brake controller took some fiddling with to get it right. At first it was grabbing pretty hard and pulling when slowing down. Unfortunately, my neighbor accross the street decided friday was a great day for a yard sale. So, when I got back there were tons of morons parking all over the place making it impossible to try and back the trailer in. So, I just parked down the street a few blocks and waited for the yard sale to get over with. My neighbor regained some karma by coming over and helping direct me. We had it pretty much ready to go all the way into the side yard, but I decided to leave it out for now while I am stocking it and such. Then, right after parking it was off to down south for a puppy play time/dinner. It was great to see T and T and T’s parents. 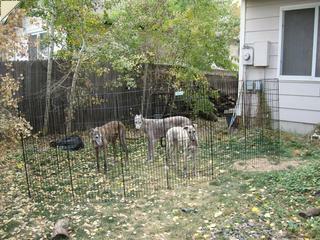 We had 7 hounds there. Nash and Maisey (the other pup, who is about a month younger than nash) had a lovely time playing and running and such. The food was excellent and very nice surroundings and company. Hopefully we can all get together more often. Nash did manage to pull a lamp over once we moved inside, but luckily the only thing that was hurt was a lightbulb and kurts phobias. but it will do for now. 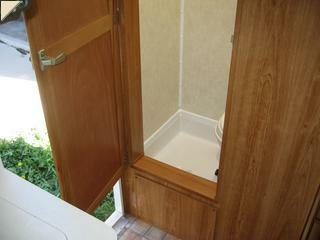 The view in the door. 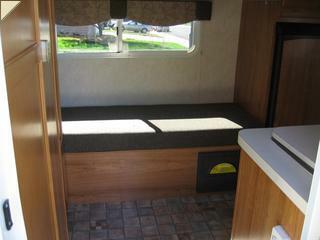 Across to the “couch” and the door to the bathroom on the left. The view from the back to the front. 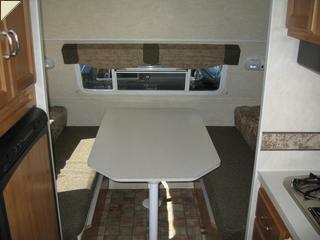 The dinette table comes off and you can turn that area into a queen sized bed. The view back to the bathroom. It’s microscopic, but should work. After hanging out in the trailer for a while, I ran out and had a far too expensive target run to get some things to stock it. It’s basically like setting up a new house. Sunday was nice and relaxed. 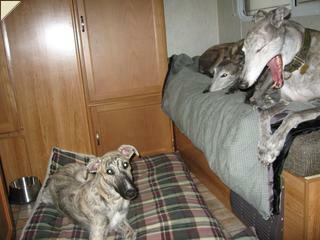 Took the dogs out for a few hours to hang out in the trailer. The a/c in there works really really well. On low it would take it down to frigid in about 10min. Placed an amazon and campingworld order for a bunch of other junk I need before hitting the road. 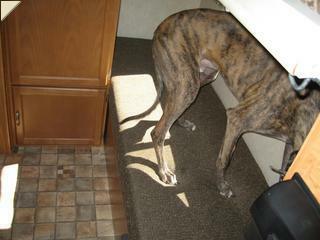 I have made a point of hanging out in the trailer with the pup for a few hours every day to get them used to it. The a/c in the doggie bunker works really well. Far too well. Even on low it cools everything to meat locker temps in a few minutes. I guess it would be more useful in the summer. of nick nacks. Should be nice to get all that stuff in and stocked. Probibly will go on a shakedown trip next weekend. Perhaps I should just make a reservation at the campground down by the faire. I know they have hookups and wireless… and a dog park. I’m going to go down to the castle rock camground this weekend (unless they are already full). Probibly head down saturday afternoon and back home sunday afternoon. Should be a good place for a shakedown voyage of the doggie bunker. It’s about an hour from here, has wireless and all the hookups. They also have a (small) dog park too. Anyone reading this is welcome to come on down and tent camp or whatever. Drop me an email if interested. Man did I get a pile of packages today. Most everything I ordered via mail order in the last few weeks picked today to arrive on. Trailer Dolly, microwave, hitch lock, coffee pot, etc. Tomorrow the generator shows up. cost on-line. ;( Guess I will order one and see how he does without this weekend. The boys, just hanging out in the doggie bunker after a walk. Here you can see how over large the x-pens I got are. They are the 48″ ones, when I should have probibly gotten the 36″ ones. (This is 2 of the 8panel ones hooked together. You can hook them easily, but you have to disconnect them to transport them). The A/C unit of DOOM. I did figure out that I wasn’t adjusting it right, so I can now get it to now totally freeze everything solid in a few minutes. 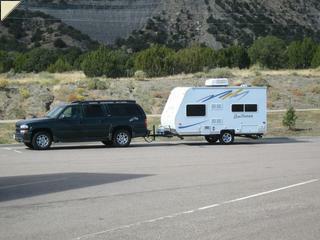 Well, headed out today for a shakedown cruise with the new trailer. I decided to just go to the castle rock campground, since they had hookups, a dog park, and were only an hour away. the awning a bit on my gate getting out of the side yard. ;( Oh well. It’s very small damage. Once I hit the road things were smooth. There was a bit of wind, but the trailer had no problems. I did get going about 70mph at some points (didn’t want to get too close to the other traffic witch was kinda heavy) and there were no issues. Power: no problem. Just a plug. Worked great. Water: Hooked up my pressure control value, hose, filter, to my “shore water” plug, and got nothing. Not sure right now if thats due to the pressure value messing up somehow, or if there is something broken with their water pump. ;( Perhaps I will look more in the morning. Sewer: no luck. I got a 10′ sewer hose and a fitting from the dealer, and another bit mail order, but there are several issues here: The sewer connector is more than 10′ away. The fittings are not compatible. Oh well. 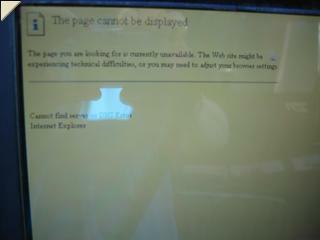 Wireless: works fine, although I had to monkey with things to register on the stupid click thru page. Nash was kinda a pest at first, but finally relaxed after a few walks. Well, looks like Nash has some roundworms going on, so I get to pick up some de-wormer for all the pups. Hopefully they will handle that ok while on our travels. Also this morning I noticed Merlin had a loose tooth when I was brushing his teeth. So, he’s scheduled now to go in for a dental tomorrow. I always hate to have them put under, and I have been putting off a cleaning for Merlin for quite a while now. I sure hope it all goes ok, and that he’s ok with travel the very next day. 🙁 I suspect he will just sleep in the car anyhow though. 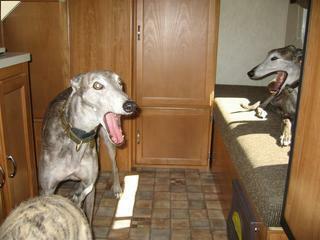 I left the pups in the trailer for about an hour today (with the a/c on). They seemed to do just fine hanging out in there while I was gone, although when I got back Nash started barking lots. He does that when I get back to the house too, so hopefully thats normal. I got home this morning around 5-6am. I had a wonderfull time, and the trailer worked great! I’ll try and write up some more detailed posts about the travel, but in a nutshell: Nukestock was great. 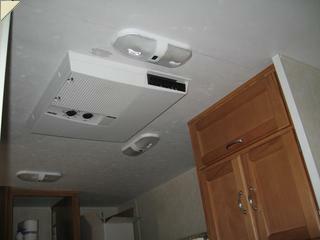 Working from the trailer in cruces worked fine. Hunting in the Gila was excellent, even tho we didn’t spot anything we could legally hunt. The Night of October 24th had me packing and trying to get everything loaded into the trailer and truck. I really should have done more packing in advance, but oh well. I ended up doing some more packing/loading Wed morning before I left, and finally hit the road at about 9am. The weather forecast had some wind in store and I did in fact hit that between raton and las vegas. Pulling the trailer in a 30+mph headwind wasn’t much fun, and boy did it kill my already abysmal gas millage, but I made it down to Las Cruces just fine around 9pm (a 12 hour drive). 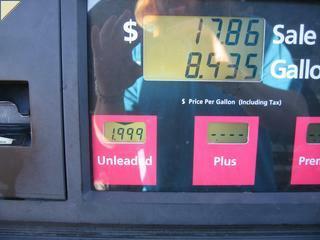 $1.999 gas when I fueled up before leaving town! A picture from a rest area on the way down. Got the trailer all parked in front of Nukestock HQ and setup. Got power hooked up and called it a pretty early night. Thursday we did a bunch of walks in the park for the dogs, a trip over to my friend V’s place to let the dogs run around in his gigantic back yard, and some assorted errands and setup of decorations. Thursday night was the beer tasting event. We had a pretty gigantic pile of beers to try. There wasn’t much of a crowd for most of the event, but people came and tried a few beers and wandered on. There were some real nice beers and some really yucky ones. 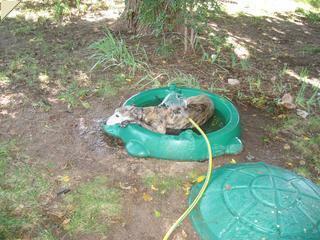 Kurt wasted no time in V’s yard finding a pool to lay in. 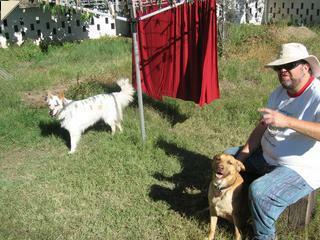 My friend K and a few more pups. 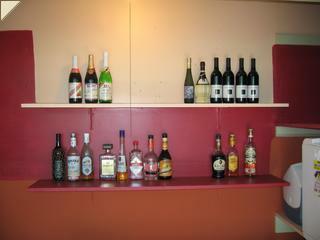 Here’s the bar before we went and stocked it up for the weekend. 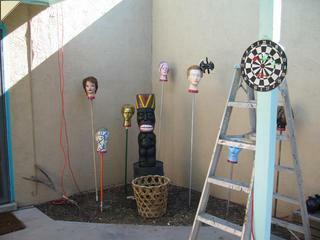 A few of the decorations. 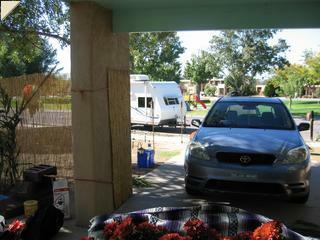 A view out to the trailer. Saturday started out with more mexican food and a trip by V’s to let the pups run in the big yard and also to pick up more firewood. Then, it was time for the road rally. It was really pretty fun this year. I like the way V had it setup. You get a photo of a place somewhere in Las Cruces. You can try and find it based on just the picture, or you can open up to 3 clues. The first 2 clues are more pictures with more clues in them, and the last one is a GPS coordinate. Once you find a site there is a bag with some tokens in it, the first team to a site gets the token worth the most points, etc. It was nice. We took a long detour at one point because I am an idiot and missed a turn, but otherwise we did well. We only had to open one second clue. I really liked the format this year. Saturday night was the full on party. Lots more drinking and K was grilling things for dinner. Lots of food, lots of drink. Big trivia game was as silly as it ever is. There was a obnoxious neighbor that stopped by, but my friend B manning the bar just gave him lots of booze and finally he wandered off to pass out. Things finally winded down around 4 or 5 am. Sunday was the after party brunch. It was nice to not have to look forward to the long drive home after the brunch this year, since I was going to stay and work from the trailer parked in front of K’s house monday, tuesday and wed. Got back after brunch and helped clean things up. Lots of trash was generated this year. I guess it’s not too surprising. 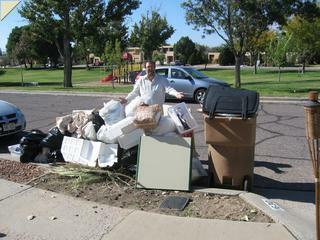 Trash pile was most impressive. The trailer worked wonderfully. The pups got pretty used to hanging out in it and having the a/c and such was handy. The bed was pretty comfy. Parking and driving and backing were all pretty easy too. All in all another excellent nukestock. … to be continued in park 2: hunting in the Gila soon.